This year, Universal Singapore really stepped up its game with the third installment of Halloween Horror Nights. With the competition just down the street boasting a tie in with Thai horror studio, universal had to up the ante in order to remain the leader of halloween events in singapore. I personally felt that this year’s event is a drastic improvement from last year’s. HHN 2 was rather disappointing, and paled in comparison with HHN 1. During the first year, although only half of the park was open, the event felt much more intense and fresh. There were plenty of things to look at, and the theatrical sets in the scare zones were stunning. The crowds were also manageable, and the entire event felt rather exclusive. We also saw many classic scare techniques deployed in the maze, and they were highly effective. These simple but elegant scares really established a high benchmark that HHN 2 did not reach. For HHN 2, the event was much more crowded, and yet there were less scare zones than the first year. Furthermore, the scare zones felt rather scarce, and there weren’t as many scare actors roaming the area as I would like to have seen. The sets were also rather unimpressive, and the fog was so thin that the scare actors had a hard time scaring anyone. The mazes were also rather standard, and lacked the diversity of scares found in the first year. I felt that the creative team found a formula for developing the scares and stuck to it, thus resulting in a repetitive experience in the mazes of 2012. A typical scare worked like this 1. Place a prop/scare actor to act as a distraction 2. Have another scare actor pop out from a hidden spot while the guests are looking at the distraction. 3. Add in loud noises and screams. The motifs for HHN 2 were also highly similar to that of HHN 1. The House of Dolls felt like a remix of Carnevil scare zone of 2011, while Total Lockdown felt exactly like the Post Apocalyptic Rage scare zone of 2011. Thus, I was really excited when the motifs for 2013 were announced. Gone with zombies and dolls, and in with vampires and Asian ghosts. The entire marketing campaign this year was extremely well done, with the advertisements for the event going up on billboards as early as July. Resorts World Sentosa also filmed many movie quality trailers, and they even created a mini site for the event. The HHN web advertisements were literally spammed all over the Internet. There was also a greater engagement with the fan community, from the periodic updates on Facebook, to the behind the scenes videos on Youtube (hosted by the beret wearing Jason Ramsburg). Prominent fan websites like Dejiki and Super Adrian Me were also invited to the special press preview of the event. I feel that this increase in fan engagement is a step in the right direction, as it creates a loyal local fan community that is evangelical about the event. 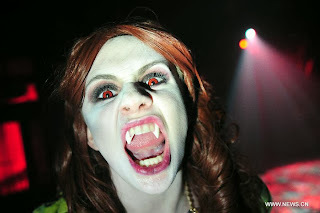 Knott’s Scary Farm in SoCal is an excellent example of a haunt event with a significant fan community. 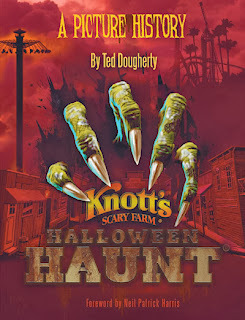 Knott’s Haunt had already spawned a book, many websites, podcasts and forums dedicated to discussing the event. Halloween Haunt - a completely fan written publication on the history of Halloween at Knott's Berry Farm. Will Universal Studios Singapore also cultivate such a loyal fan base? Perhaps a future direction the marking team can take is to reveal more of the behind the scenes process of making the event, as well as introducing the public to more of the personalities behind the show (Jason Ramsburg, we still love you, but we love to see new faces too!). Another addition can be the production of shorts or special features with the terrestrial TV channels and terrestrial newspapers so that the general public will be introduced to the event (HHN is still very much a niche event that is limited to the teenage crowd). I would like to applaud Universal Singapore for creating original icons for the event for the past two years. These icons are plastered all over the promotional materials as well as within the park, thus serving as prominent and instantly recognizable characters for the visitors. I was also very delighted to see the park integrating Asian elements into the characters. 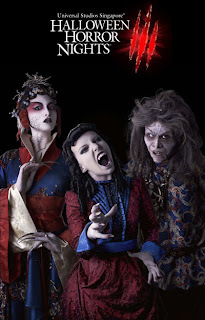 The Crone of the Forest is an excellent reinterpretation of the South East Asian ghost of the jungle, while the Opera singer is an amazing homage to the Chinese Opera art form. 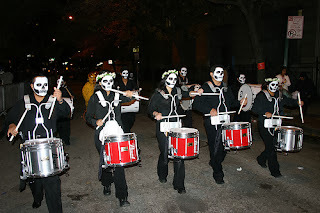 As I visited the event on Halloween night (31 Oct), which was a Thursday, the crowds were significantly lighter, and so my experience may not be representative of all the nights of the event. This year, they had extended their opening hours from 8pm-12am to 7pm-1am. This change was definitely for the better, as guests now had ample time to visit the entire park and experience all the attractions. However, I am not certain if the closing time of 1am was too late, as the park was mostly empty of visitors by 11.30pm on the day I visited. (Perhaps that was because it was a Thursday). 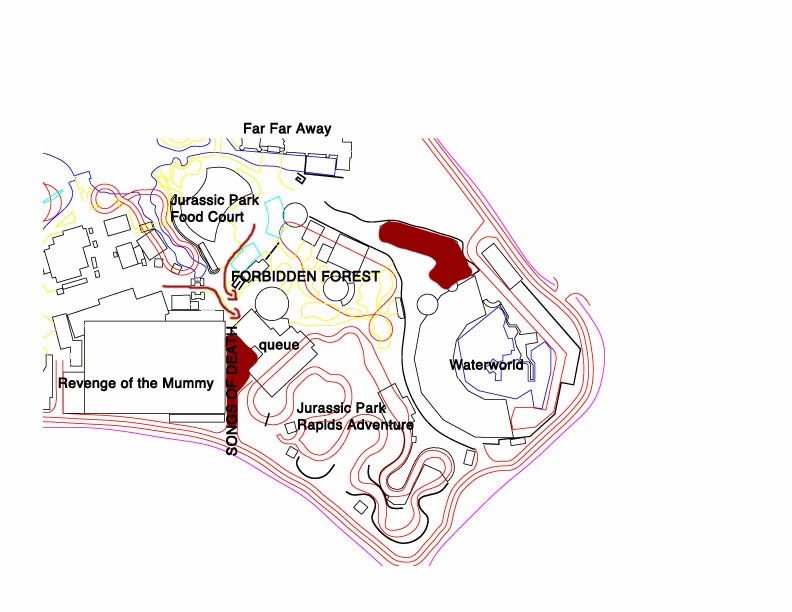 The park decided to not place any scare zone in the Hollywood area, a departure from the previous two years. I felt that this was a wise choice, and it allowed an altogether more pleasant experience. The park was able to allow visitors to enter 15 minutes before 7pm, thus easing the congestion in the Bull Ring outside the park entrance. Instead, visitors were ushered onto the streets of Hollywood, where a nightly rope-drop show marked the start of the night’s event. Apart from being a great crowd control technique, this decision also prevented the shops along Hollywood Street from being blocked by the scare zone sets. Thus, the operation of the shops and restaurants were not disrupted, unlike the previous years where the sets effectively blocked all the shops from the view of the guests. The opening rope drop ceremony was also extremely well done, and managed to generate anticipation and excitement for the evening. The (almost) deafening music was also well selected, and definitely helped to create the spooky-party vibe. Although the illusion of the three sisters disappearing was frankly rather expected and conventional, the show still managed to pack enough punch to get the crowd all hyped-up for the night. The pyrotechnics were also amazing. The first maze, Possessions a.k.a House 13, was constructed in the Waterworld queue. This location was home to The Insanitarium maze last year. However, unlike in 2012, where the entrance to the maze was constructed at the entrance to Waterworld, the entrance of Possessions was hidden well within the Lost World zone. I feel that this was an ingenious move, as guests will now have to enter the dark and foggy forest of Lost World, thus building anticipation and hype for the maze. Furthermore, placing the entrance deep within a scare zone also helped to spread the crowd out, thus allowing the maze to maintain a rather stable wait time, unlike Songs of Death, which experienced wild fluctuations in wait time since it was located right off the thoroughfare. This maze was exceptionally claustrophobic. It contained some innovative scare that was never seen before in the previous events, such as the camouflage man and the newspaperman. There was also the use of scent (or odor for that matter) in the toilet scene (though it was also used in 2012). All in all, this maze was a decent experience, and it did manage to deliver some scares. However, it lacked the creativity of The Insanitarium maze, such as the water tank effect, the handstand man, the rocking tables, and the multiple exits. One disappointment in Possessions was the chainsaw man. Chainsaws are usually a huge feature in the US versions of Halloween Horror Nights. Therefore, I was very excited when I found out that this maze was to feature a chainsaw man. However, it turned out that the chainsaw man was very mild and tame, and altogether unintimidating. Instead of using an authentic chainsaw with the cutting chains removed, Universal Singapore used a dummy chainsaw and attached a small speaker inside which played back the chainsaw noise. Perhaps Universal Singapore may consider having a chainsaw scare zone (with authentic chainsaws) next year? 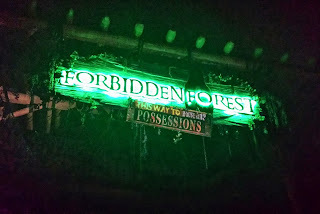 The Forbidden Forest scare zone was located in the Lost World. This was the first time a scare zone was constructed in this area, and I must say that it was really well done. This zone was the scariest of all three zones, and it had the best ambience. The thick fog was the perfect cover for the scare actors to target their victims. The scare actors in this zone were all very quick on their feet, and managed to deliver some of the best scares of the entire event. It must have been really difficult and physically demanding to navigate the thick fog and scare guests for six hours a night. Although I went on the Thursday of the final week, I could sense that the energy level of the actors were still exceptional. 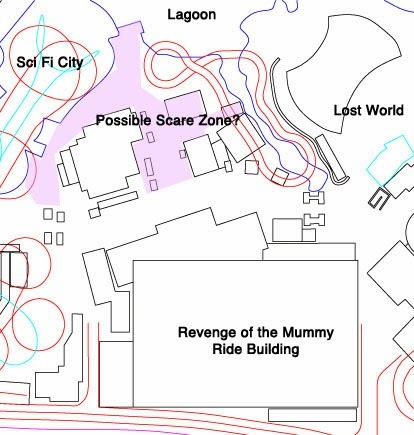 I am really curious to see how the creative team will reinvent themselves on this scare zone next year, as I cannot imagine any other theme that will fit the Lost World area. Moving on to the next maze, the Songs of Death. I find this the most impressive maze of this year’s event. From the façade to the finale, this maze was top notch, and even surpassed Adrift in terms of scare factor (perhaps it was due to the source material? 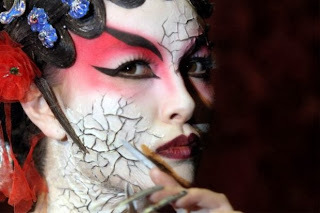 Chinese Opera is scary in and of itself). The maze was very detailed, and it was all the more impressive as this maze was constructed in a temporary tent squeezed between the Mummy building and the Jurassic Park ride. Songs of Death was constructed in such a narrow space! This maze had one of the most dramatic entrances: a fully constructed façade of a Chinese Opera academy, along with an outdoor theater. The various scare elements along the maze was also very impressive, especially the mirror maze segment, which was highly disorientating and intense. The ambience within this maze was top-notch. The use of richly detailed textiles in the maze was great, and added to the realism and the authenticity of the experience. One possible improvement for future mazes located in this spot will be to station scare actors after the exit of the maze, along the long corridor that leads back out onto the main thoroughfare. This is the best time to scare guests, as they will have their guards down since they perceive the maze to be over. 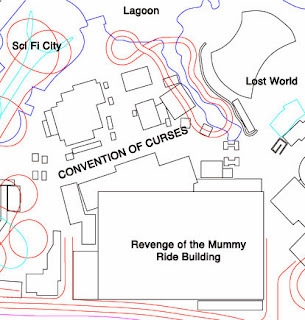 The Songs of Death maze would empty out to the Ancient Egypt scare zone, which was the location of the Convention of Curses scare zone. This scare zone was an update from the Bizarre Bazaar zone of 2012. The kiosks were much more interactive and fun to look at, and the actors (especially the Nightmare Ripper). One of the problems with the Bizarre Bazaar zone last year was the congestion that was caused by the crowds stopping in front of the various kiosks along the thoroughfare. This problem was significantly improved this year, and the movement through this scare zone was largely smooth. I would also like to commend the park for having the Coven Celebration show in front of the Obelisk. I must say that this was a great improvement from the 44 Sins show that was also located on the same spot in 2011. The actors were amazing, and this really contributed to the ambience of the zone. 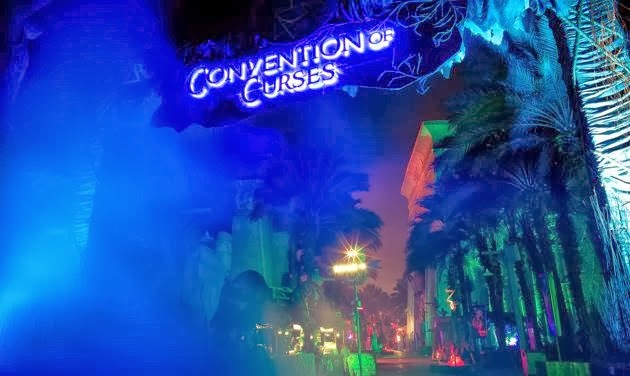 However, I do feel that this scare zone is a repeat of the Bizarre Bazaar scare zone, and I am definitely very curious to see how Universal Singapore can reinvent this scare zone for Halloween 2014. Furthermore, owning to the straight layout of the Egypt zone, there were also limited opportunities for the scare actors to scare the guests. Perhaps Universal Singapore may consider using the area facing the lagoon for their scare zone next year? 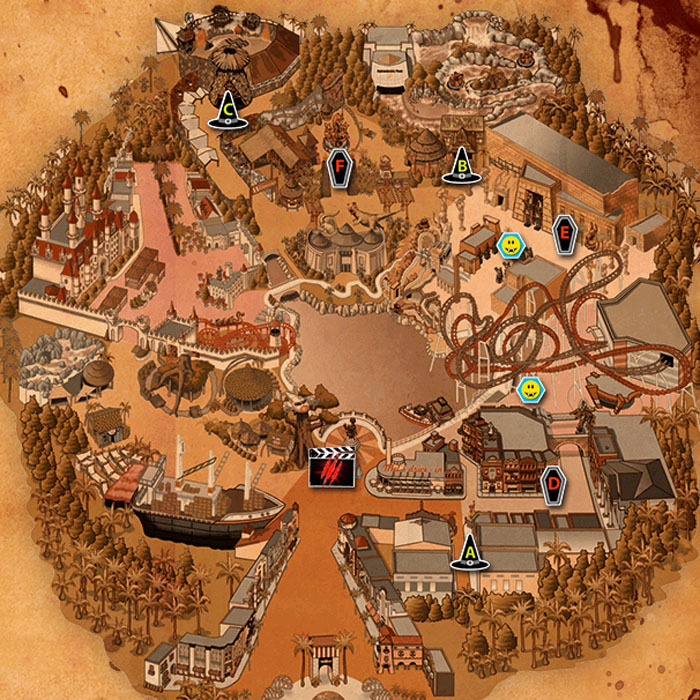 That area has a lot of meandering walkways, thus making it an excellent location for an intense scare zone. 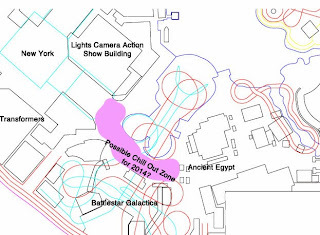 Furthermore, that will also leave the main thoroughfare in front of the Mummy ride empty, thus improving guest circulation by easing congestion. Possible space for a scare zone? 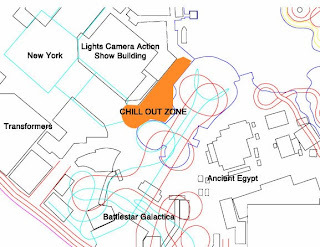 The Chill Out Zone located in Scifi City was a rather charming idea, though it was rather lacking in execution. Despite the presence of live music and laser beams, there wasn’t a significant enough reason for guests to pause at this zone. The outdoor bar/ lounge area was largely empty on the night I visited. A suitable model that Universal Singapore might consider is the ElecTRONica event held at Disney’s California Adventure from 2010-2012. During ElecTRONica, the entire area was transformed using impressive lighting effects to simulate a Tron landscape. Furthermore, there was also an amazing Laser Man show as well as a bar that served alcoholic beverages. 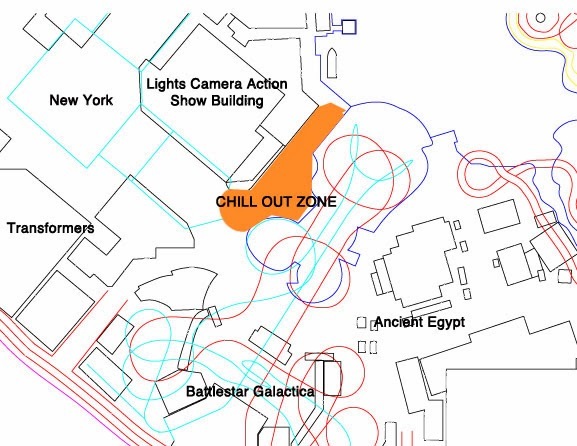 ElecTRONica at DCA California - a possible model for Chill Out Zone? Possible Chill Out Zone for 2014? The final scare zone at this year’s Halloween Horror Nights is the Attack of the Vampires at the New York area. This scare zone was a radical departure from the previous scare zones in the same location. Gone were the zombies and mutants. Instead, we welcome vampires, gargoyles and werewolves. When the zone was announced, I was rather skeptical as to the ability of the creative team to transform the New York zone into a gothic cemetery, but after experiencing the zone, I must say that they did a great job. The set pieces and props at this scare zone were phenomenal, and the backdrop of the New York buildings simply fades away. Instead, you feel as though you have been transported into a gothic village/ cemetery. 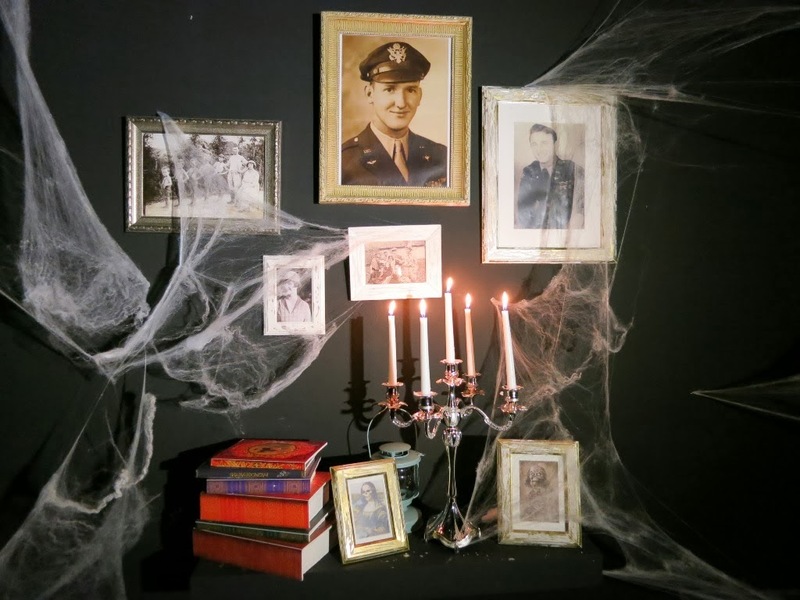 This zone also felt more cluttered with props and set pieces, thus creating many niches and crannies that scare actors can ambush unsuspecting guests from. This was a welcomed improvement as the previous iterations of the maze in New York zone were too open and too direct. The Birth of the Vampire show was also amazing. The New York Public Library building was utilized brilliantly as the backdrop for this 5 minute long show. The lighting and ambience was excellent, and so were the blocking and the choreography. The “plant” in the audience was also a welcomed surprise. Ultimately, I would argue that scare zones are actually more significant than haunted houses in determining the overall guest satisfaction. Haunted houses are relatively short (5-7 minutes) experiences, and entail a long (30-120 minutes) wait in massive switchbacks with little to see or do. Furthermore, the haunted house lacks the degree of social interaction, as guests form a massive conga line and file through the maze, with little opportunity to talk to their friends. On the other hand, the scare zones are the areas where the guests will spend most of their time, and they are also the areas where guests can get scared without queuing in line. Visiting a scare zone is ultimately a social experience, as guests are able to walk through the zone with their friends and interact with the scare actors. Therefore, I think that it was a step in the right direction when Universal Singapore decided to include many small shows and interactive elements in the scare zones. This brings the quality of the scare zones to a new height by making it a theatrical experience. Finally, the gem of the night has to be Adrift. Adrift, located in Stage 28, was the most elaborate and impressive of all three haunted houses. Universal Singapore really outdid themselves with this maze, and I am excited to see what sorcery they can cook up next year. As Adrift has the luxury of being located in a soundstage, the set pieces were definitely much more impressive that that of the other two “tent” mazes. From the flooded room to the slanted decks, Adrift was a sight to behold. We also saw some interesting scare techniques in this maze, such as the Pepper’s Ghost effect as well as the levitating girl. I would definitely recommend visitors to go through the mazes multiple times if possible, as each experience would be different. We managed to see certain effects on our second visit to Adrift that we missed on the first, and vice versa. Overall, I felt that the event was decent, though there were still room for improvement. 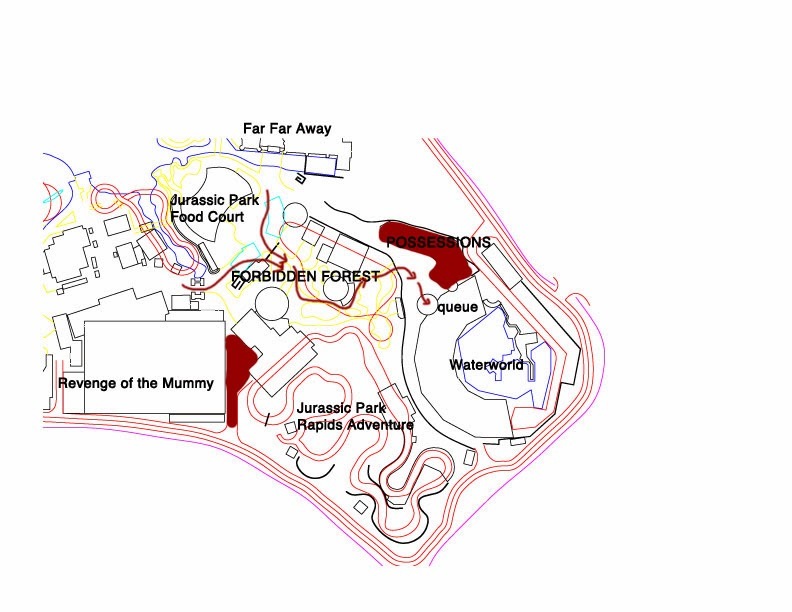 The attractions felt rather lopsided, as they were all concentrated on the southern side of the park, while Madagscar and Far Far Away were very underutilized. 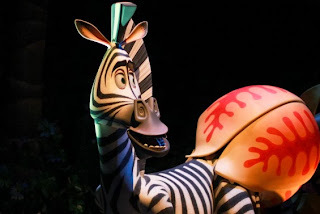 Certain attractions like Jurassic Park River Rapids should be operational, while others, like Madagascar: A Crate Adventure and Shrek 4D should not be open, as they were completely incongruous and unsuitable for the target audience of the event. Crowd control was relatively well done this year. However, one of the main drawbacks of big events like Halloween Horror Nights (as opposed to small haunts) is that single-file conga lines will inevitably form within mazes, thus diminishing the scare factor. Perhaps Universal Singapore may consider widening the passageways in the mazes, or creating multiple pathways through the same room? The event length of 10 nights also felt a little too long, as the hype for the event generally died down on the last weekend. The crowds for the Hollywood and Orlando Horror Nights get heavier towards October 31st. However, the concept of Halloween as a holiday on October 31st does not really exist in Singapore, thus we do not experience heavy crowds towards Halloween. Instead, the attendance figures appear more like a bell curve, with lighter crowds during the opening and closing weekends, and heavier crowds in the middle of the run. This is because the crowds will come mostly during the second and third weekend after hearing the word of mouth from their friends who have visited on the first weekend. 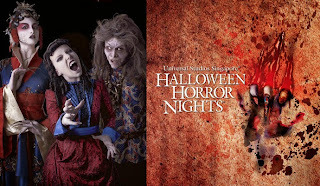 Thus, I propose that Halloween Horror Nights 2014 be held on 27, 28 Sep and 3, 4, 5, 10, 11, 17, 18, 24, 25 Oct. By placing opening weekend on the last week of September, Universal Singapore will be able to capitalize on the Hari Raya weekend on the first week of October. I would definitely like to see Universal Singapore expand their scare zones, especially if they decide to utilize either Madagascar or Far Far Away as that half of the park has been underutilized. A possible Halloween overlay of Donkey Live will also be awesome. Given that it is a highly customizable show, this Halloween overlay should not be difficult. Furthermore, given the more adult demographic of the event, Donkey would also be able to make more adult oriented humor. Other possible live entertainment options would include: a pop culture satire, a night lagoon show, or even a parade. 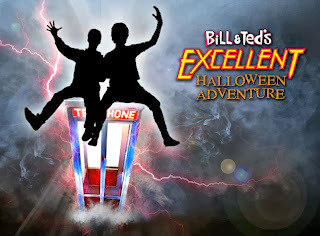 Pop-culture satire shows are a staple in the American Halloween Horror Nights (see Bill and Ted's Excellent Halloween Adventure). Given the popularity of local satire website MrBrownShow.com, as well as the Noose, it is therefore highly appropriate if Universal Singapore capitalize on this trend. 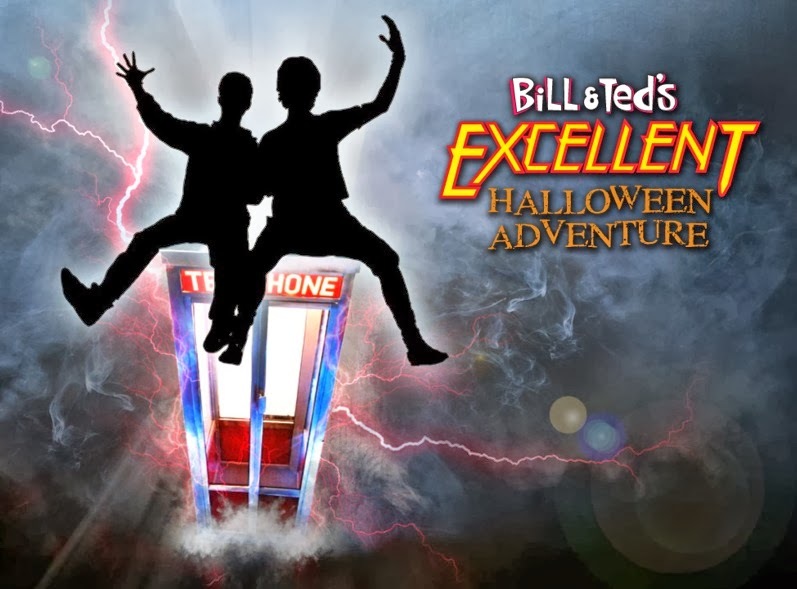 Perhaps Jason Ramsburg can produce satire show for 2014 given his experience in Bill and Ted's Excellent Halloween Adventure? 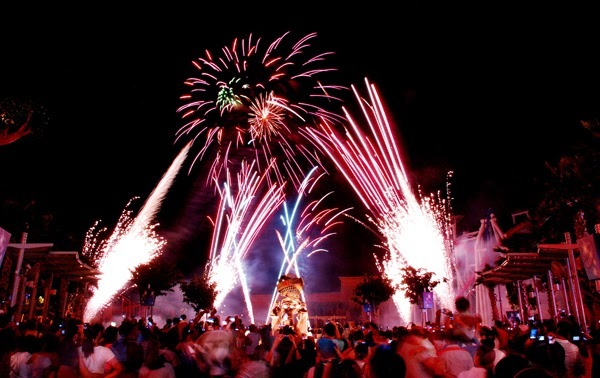 A night lagoon show would also raise the bar for the event. This can be a simple fireworks show with Halloween related soundtrack. This will cap of the night and help it end with a bang. Currently, the event starts with a bang (the rope-drop ceremony), but ends on a whimper. Fireworks to end the night with a bang? A parade would also be a novel idea, as it will provide street entertainment for guests. A possible example to consider would be the Roaming Legions seen in Halloween Horror Nights 22 in Orlando. This parade does not have to entail large floats or elaborate sets, but instead can rely on the talent of the actors and their ability to scare the guests. A 4 scare zone + 4 mazes + 2 show lineup would be perfect for Universal Singapore, given its limited size and limited audience. I am not opposed to Universal Singapore recycling old mazes as long as they keep adding 2-3 new mazes each year. Although the event icons (The Director, The Puppet Master, The Sisters of Evil) were highly creative and impressive, they lacked the instant recognizability that characters from well-established Intellectual Properties have. Sentosa Spooktacular, the event just across the road, tapped onto the Thai horror movie icons that the local audiences were familiar with, such as Shomba from Coming Soon (2008) and the eponymous Pee Mak (2013). Sentosa Spooktacular, despite operating on a smaller budget than Halloween Horror Nights, received an amazing reception, and had 4 sold-out nights (out of seven). Therefore, it might be wise for Halloween Horror Nights to also introduce Intellectual Property themed mazes and scare zones from next year onwards. I am sure that this will do wonders for the attendance (just imagine a Conjuring themed haunted maze!). In fact, Universal Studios is known for being the place where you can “Ride the Movies”, so it is only natural that Halloween Horror Nights feature movie characters. Anyone up for a Conjuring maze? I look forward to HHN 2014. Three years back, I wrote an article regarding the attractions that we could have gotten vs the attractions that we actually got. With the 3rd year anniversary of USS, it's definitely time to see if we have any updated to the list. So what did not make the cut? This attraction is rumored to be a "behind the scenes" look into the Dreamworks animation studios, showing visitors the inner workings of the animation process. However, this attraction got cut, probably due to licensing issues, as well as problems with guest appeal. A certain iteration of this studios made it into the final stages of planning, in the form of Stage 28. 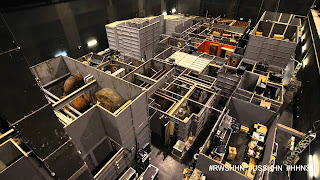 Stage 28 was supposed to be an attraction that allowed visitors a peek into the magic of movie making, as well as transport visitors into various memorable scenes of Universal Studios movies. Stage 28 survived for a very long time on the "coming soon" list. 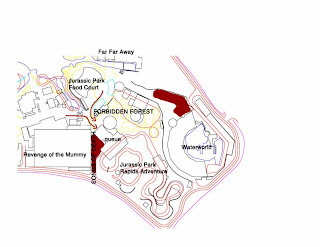 However, on May 2012, it was announced that Stage 28 will be replaced with Sesame Street Spagetti Chase ride. This move was probably done to increase the marketing appeal, and to cater to the young demographics of visitors. These two rides are simulator rides, where visitors board simulation vehicles placed in front of IMAX screens. These are spectacular, big-budgeted attractions, that are huge crowd drawers. However, I suppose Back to the Future got cut as it is a 20-30 year old franchise, while the Simpsons Ride got cut due to licensing issues with FOX studios. I am going to predict that the next attraction to be built by USS will be a simulation ride like Back to the Future or Simpsons, as the park is lacking such an attraction. These two are special effects shows that give guests a peek into the special effects used in Hollywood blockbuster movies. Although these two attractions got cut, we got Lights Camera Action Hosted by Steven Spielburg. LCA by Steven Spielburg is a similar attraction that utilized physical special effects to give guest the feeling of the "Storm of the Century". These two attractions are targeted at the 3-10 years old age group. Although these attractions got cut, certain elements from them remained on the drawing board, and finally made their way into the Sesame Street ride. ET Adventure utilized a hanging overhead rail system to simulate the feeling of flying on ET's enchanted bicycle. The current Sesame Street adventure also utilizes the same ride technology. This is an attraction located in Orlando and Osaka, and it is basically a 4D simulation ride through the streets of New York. Although we did not get this attraction, we got Transformers, which can be considered the 2nd Generation version of this ride. The ride technology is the same, and the storylines are also roughly similar. A condensed version of the hit Broadway musical. This attraction got cut probably because of the limited appeal as well as licensing issues with Universal Theatrical. These 3 attractions cater to an age range that Universal Studios Singapore currently misses. The teen 16-30 year old crowd will love these 3 attractions. However, currently in USS, we do not have any of these attractions that appeal to this crowd. I am going to predict that the next attraction announced for Universal Studios Singapore will be a attraction based on a film property of the 16-30 age demographics. So, in conclusion, I must say that although we could have gotten many other amazing attractions, the current line-up of attractions are actually very well thought-out and carefully planned to cater to most of the age demographics and bring in the "marketing muscles".